Zick Alert! Spotted, Heading East! 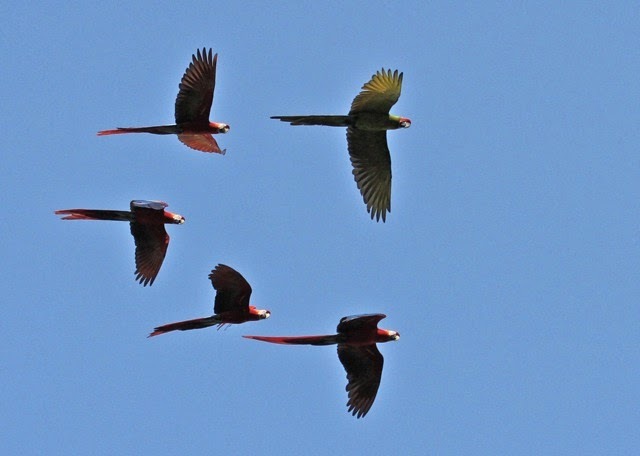 When the macaw and monkey show subsided, most of our group wandered on down the lane on Don Alvaro's finca to see what we could see. 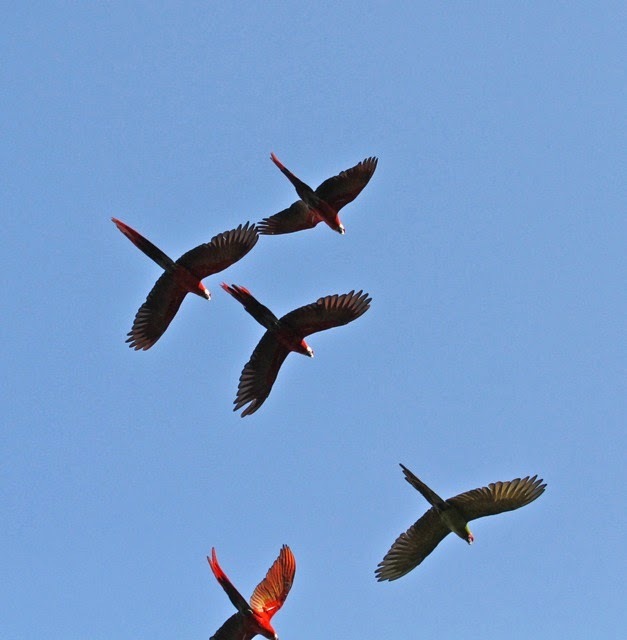 I had heard macaws screaming over the river just downhill, and I wanted to see them fly. 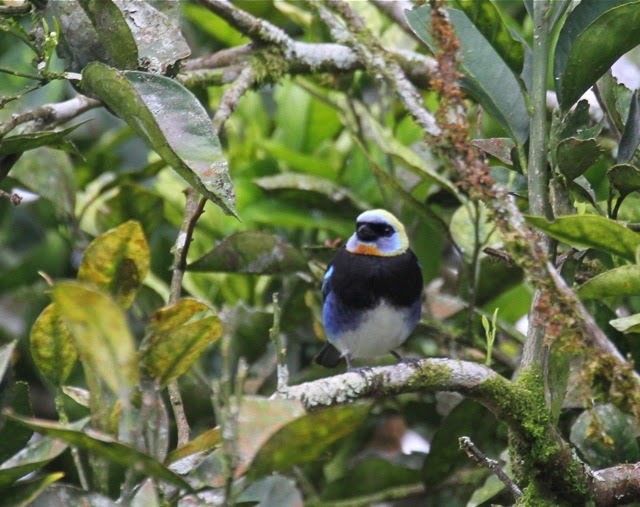 On our way we came upon a most remarkable fruiting shrub, which was full of the most remarkable birds, like this golden-hooded tanager. 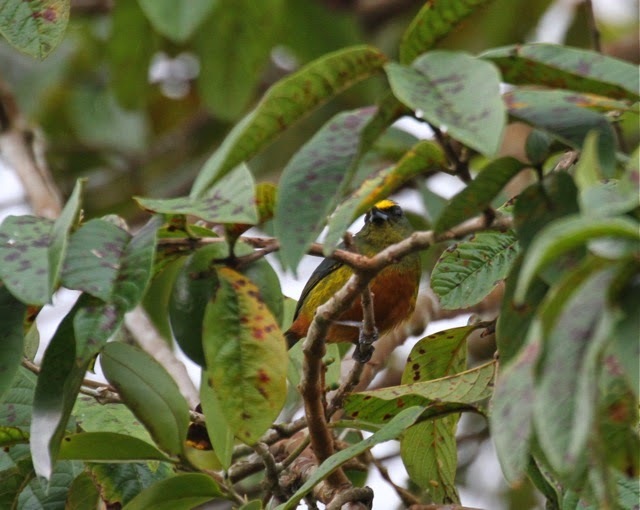 An olive-backed euphonia glowed in the leaves. 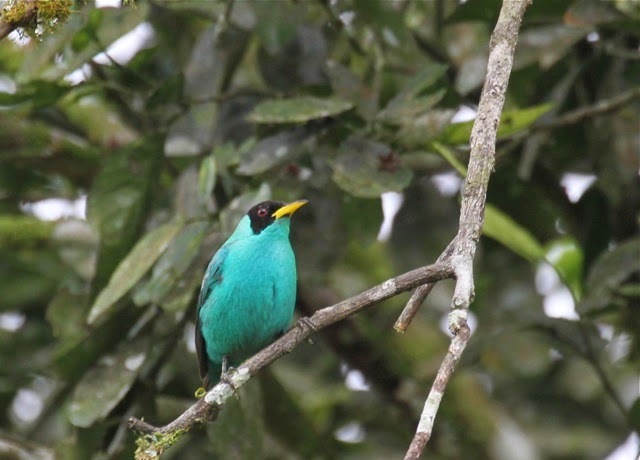 Green honeycreepers never fail to draw gasps for their intense sea-green plumage, their velvet black masks. The red eye and yellow bill, just cherries on top. It was a tree full of wonder. 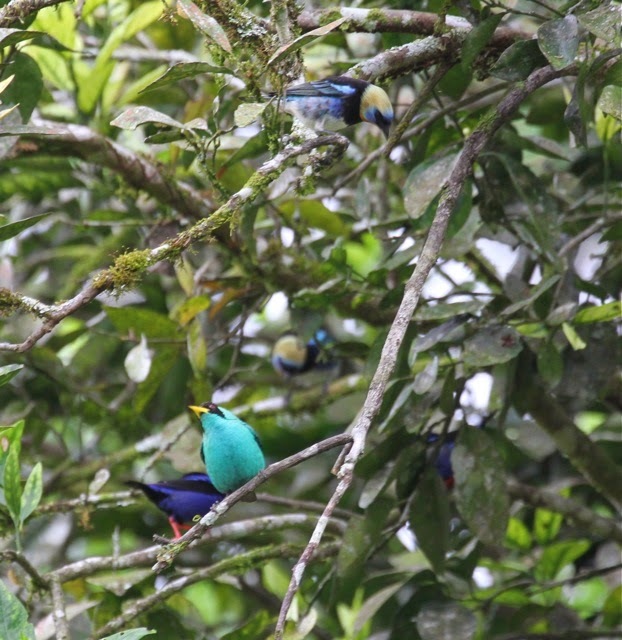 In this photo: two golden-hooded tanagers, a green honeycreeper and two red-legged honeycreepers. Can you find the second one? 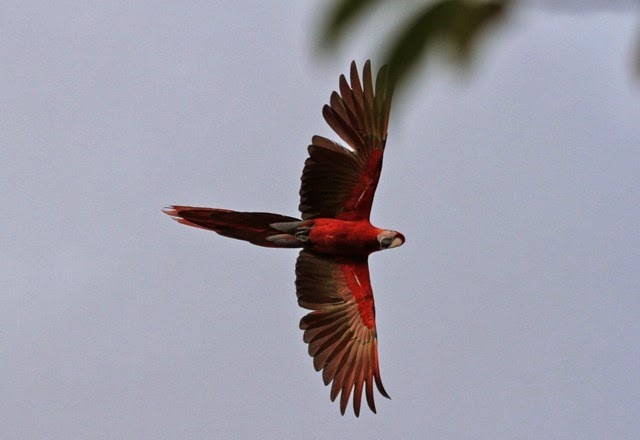 There commenced a display interaction between two male red-legged honeycreepers, in which they rapidly stretched skyward, then bowed, showing each other their turquoise beanies. 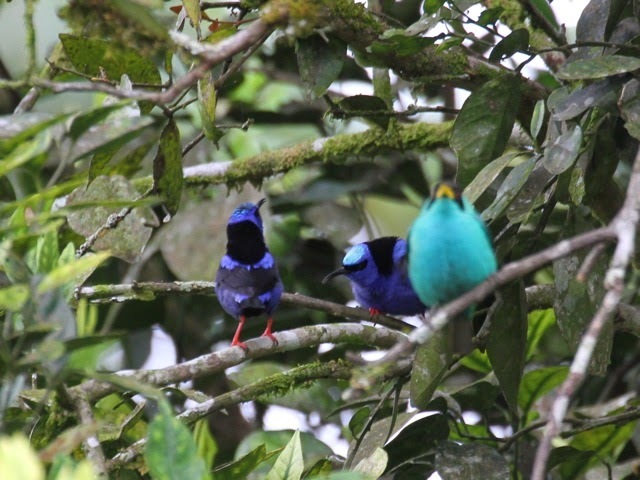 I was put in the unprecedented position of being a touch mad at a gorgeous green honeycreeper for placidly bombing the shot. Derrr! This happens to me all the time in Ohio. Durn green honeycreepers, always wantin' in. 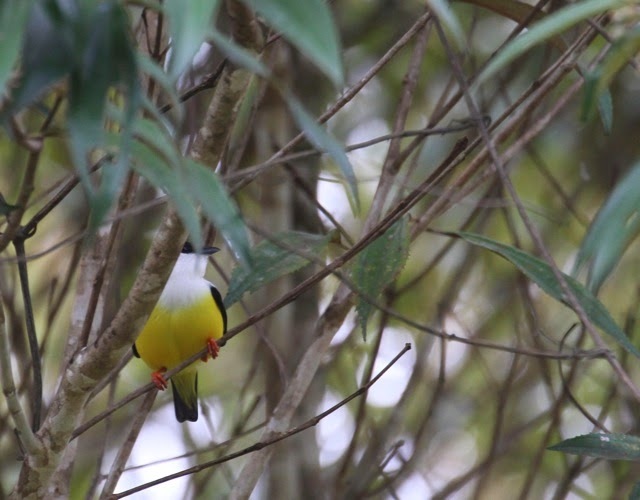 A male white-collared manakin played coy. Sigh. My best shot. It can be very difficult to get a decent photo in dense vegetation. I wanted more of this velvety wonder, but never got it. 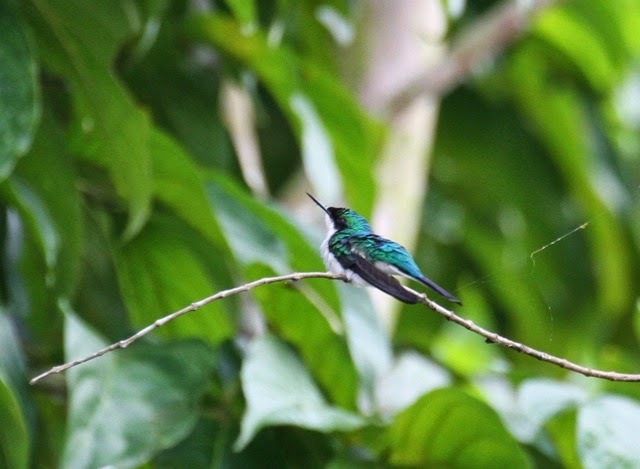 A purple-crowned fairy (hummingbird) slept on a distant bough. I crept toward it and photographed it without frightening it, then crept back. Such an elegant bird. I'd have loved to get closer but it wouldn't have been worth rousing the bird. 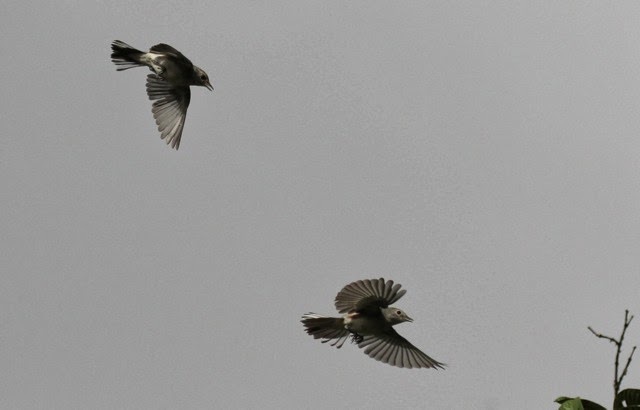 I wandered away from the group to see what was going on with two small birds who were furiously fighting. They were moving so fast I couldn't even tell what they were. 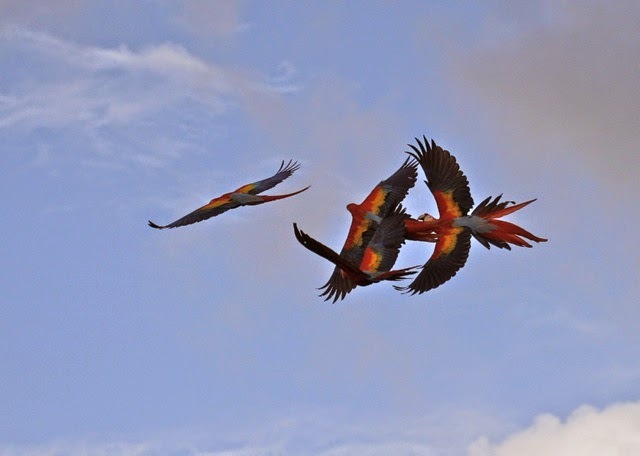 I just shot as they looped and twirled over my head. As I was to do so many times on the trip, I enlarged the image and quickly looked at the screen. No time for a binocular look--they wouldn't sit still. So I let the camera freeze them. 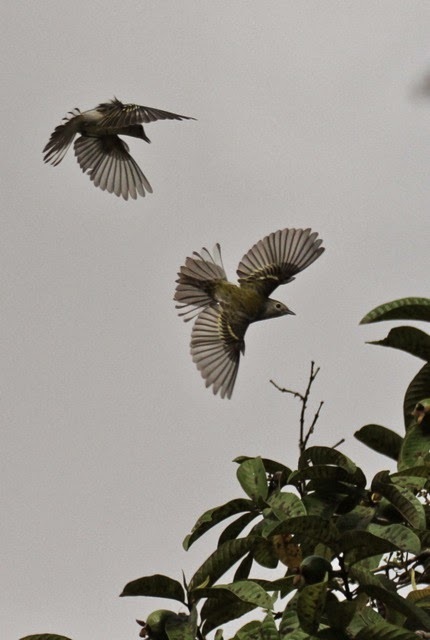 Chestnut-sided warblers! My old pals from Connecticut! Now in drab winter plumage. Memories flooded my mind. In June of 1986, I attended an International Ornithological Congress in Ottawa. I was just a baby bird painter. But I exhibited my plates for a proposed revision of Birds of Insular Newfoundland. I realized then, but even more keenly realize now, how lucky I was to be there, and I thank ornithologist Bill Montevecchi of the Memorial University of Newfoundland for helping me get there. I attended a lecture by the brilliant and sadly missed Russell Greenberg, who was to become a friend, mentor, illustration client and overall hero over the ensuing years. That might not have happened had we not met at the Congress. In the lecture, he stated that chestnut-sided warblers are mentally quite inflexible. Neophobic, he called it. 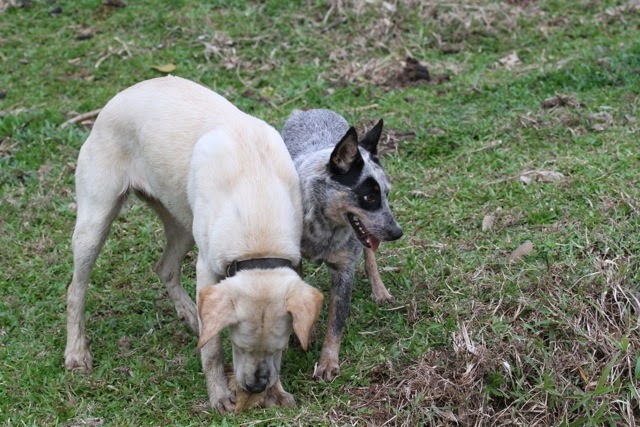 They have one foraging strategy--underleaf gleaning--and stick to it. 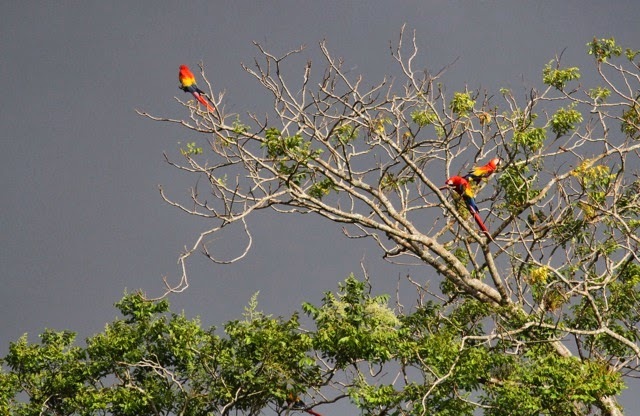 When they take fruit on the wintering grounds, they are very territorial, and will defend a favorite fruiting tree from conspecifics. If you're inflexible in your foraging, if you only take a few types of fruit, you're probably pretty cranky about anyone horning in on your stash of food. Not a flocker, to say the least. I was seeing this behavior right over my head. 70-300 IS L telephoto lens. But it was only to get better. 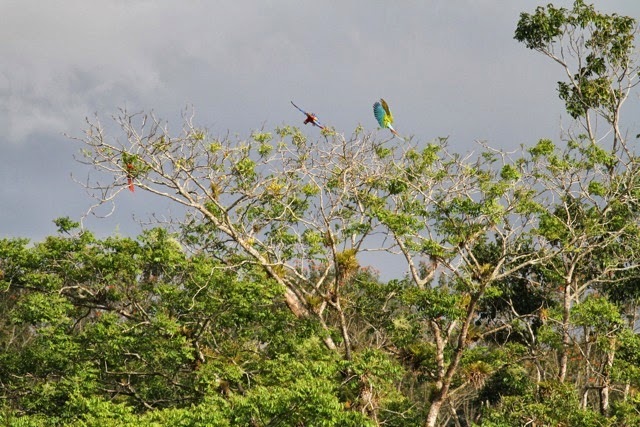 For the macaws were adjourning, out of the reach of annoying monkeys, in a treetop along the river. 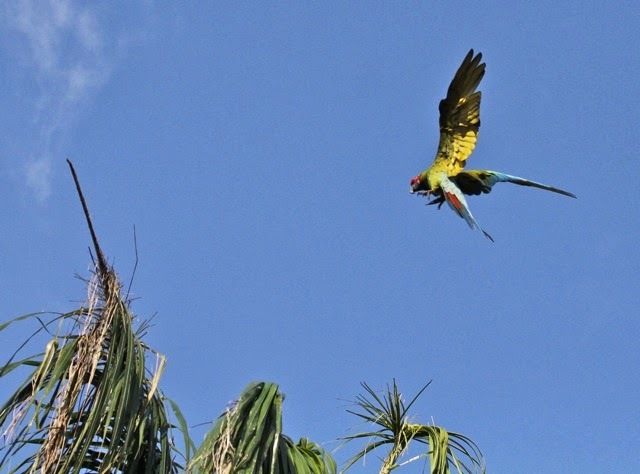 A great green and a scarlet come in for a landing. HRAWWWWKKK!!! free against a towering sky. I've said enough about that. Just look at them. No Balinesian artist could dream up better gods. Don Alvaro's farm is a magical place filled with cattle, yes, but its heart is populated with economically useless, high investment animals, all dearly loved and tenderly cared for. Even the dogs were adorable. When we got out of the bus a huge pitbull mix flopped at our feet and thumped her tail. I was on it like Bluebonnet. These little characters were playing with a bit of rubber, accepting my dog-starved lovin's. Oh I needed some animal contact! I tried to tell Don Alvaro how much this afternoon had meant to me, and failed. Just clasped my hands in front of my chest and bowed, wordless. Gracias, Senor. Muchas gracias. I'd have to write it here and hope someone showed it to him someday. As we rolled out the road, a water buffalo turned and walked toward us. He was imposing, to be sure, a great India rubber beast packed with muscle. Oh how I wanted to run to him, to scratch his ears and touch noses with him. 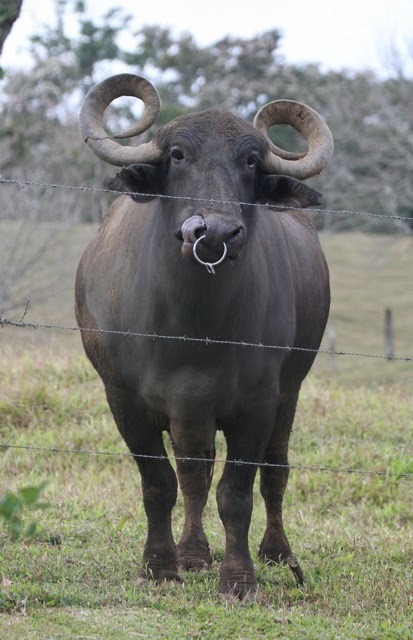 Scary nose ring and all, I was sure he'd be as lovely as the female pitbull, the sensual curassow, the serene donkey, the jealous paca. He tossed his head, showing off his curly horns. I wanted me some of that tightly packed buffalo magic. Mario told me to stay on the bus. Next time, W.B. I'll sneak off and see you. We'll talk. I'll pick your ticks. It's a date. Such a fabulous series of posts!... hope indeed Mr. Alvaro sees them at some point; I can just picture the smile on his face. This trip is on my "bucket list". Only now I want to go on the trip you are on! Such descriptions, such emotions, such pictures, such knowledge. 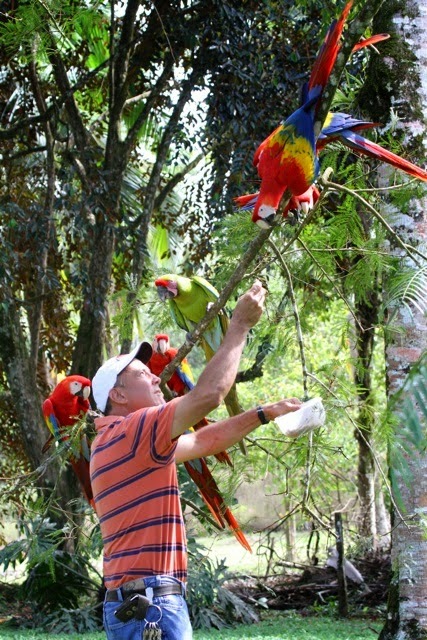 I just know at some point there will be painting of these macaws. Thank you for sharing your experience, your emotions, your gratefulness with all of us. Julie, your stories and photos are fantastic. 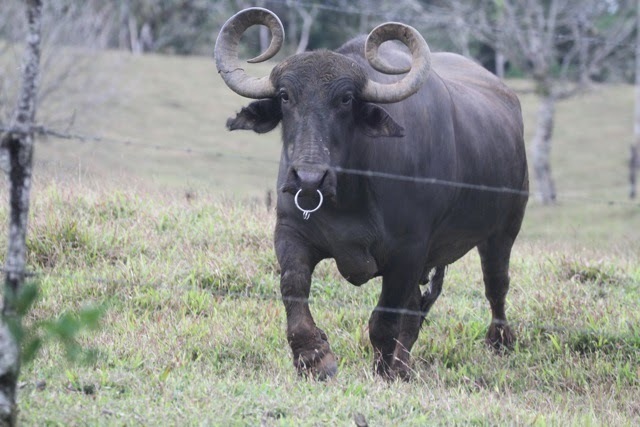 While I have adored the birds, I am somewhat fascinated by the m c escher-like photo of the water buffalo. His legs are perfectly puzzling in the last photo! Somehow I think Don Alvaro knows despite your inability to express your feelings to him in words. Thank your for sharing. Don Alvaro indeed does know how much we appreciate what he is doing. It showed in his face and how it showed in ours. I'd go back there in a heartbeat! What an amazing experience for you all. It does my heart good to know of Don Alvaro and his sanctuary. 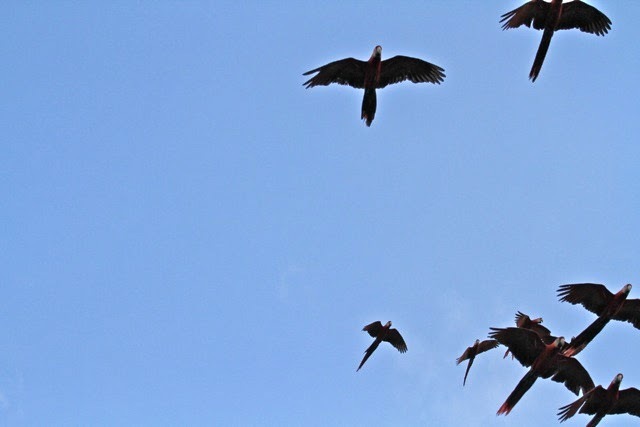 I choked up too at the photos of the free-flying macaws, so joyous and wild. 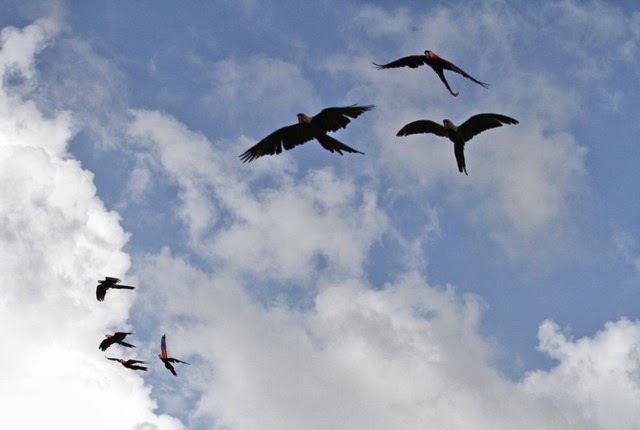 I saw a PBS program called Parrot Confidential about a small group in Costa Rica that is hand-raising the hatchlings of mated captive macaws and trying to teach them how to live in the wild, then releasing them. Now that would be worthwhile work for a lifetime.